It's been a while since the last time I wrote a beauty post. I was focused on fashion posts, I almost forgot you love reading beauty posts as well. 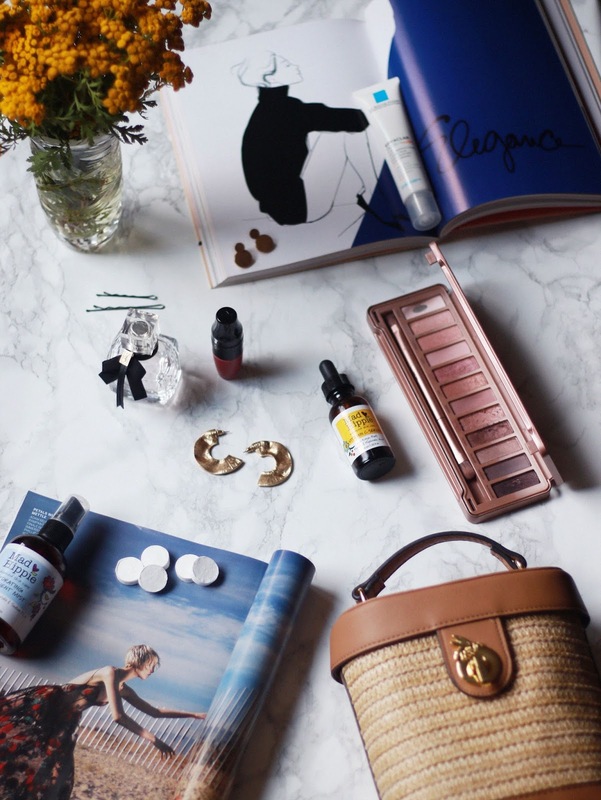 I decided to share with you my favourite essentials I can't live without on a daily basis. There was a lot of them actually, but I had to stick to few of them. I decided to put more emphasis on skin care as it's more important then make up and If I wrote about make up, this post wouldn't have an end. Let's hop in it right away! The first product I want to talk about is Mad Hippie Vitamin C Serum. This is one of the most popular serums in the beauty world, I was so eager to test it out! It promises to smoothen, tighten and brighten the skin. It has Vitamin C, Vitamin E, Ferulic Acid, Hyaluronic Acid, Konjac Root Powder, Grapefruit, Chamomile Exctract, Clary Sage. Click here for detailed clarification of ingredients. I am using it now for almost two months and I am very pleased with the results. My skin feels smoother and brighter and in general, looks much better. I use it every day and night, I apply few drops to my face and neck. It soaks up really fast and it's not leaving that tightening effect. It moisturizes the skin very well, I don't need a cream after it, except if I'm going out and I need cream with spf. I use this serum with Mad Hippie Hydrating Nutrient Mist. This is a perfect combination for me! I think that the mist in a combination with the serum gives amazing hydratation. It's very different from all the ones that I have tried. It comes in a bottle with a pump, but it doesn't sprinkle in the usual way, it's thicker than the usual ones and you need to massage it in your skin. Don't be confused, it's not heavy or oily, it just have a thicker consistency and that's why it gives better moisture to your skin (or at least I think so). The ingredients in this one are: Hesperidin, Sodium PCA, Milk Thistle, Ginkgo Biloba, Sodium Hyaluronate, Vitamin C, Resveratol, Green Tea, White Pine Bark and Pomegranate Seed Extract. Click here for detailed clarification of ingredients. One thing that makes me love this product more is that I have used it twice today already and haven't even spent the third of it. I love it and I think it's worth every penny! A beauty tool that I loved for the past few months have been compressed sheet masks. They look like tablets that open up when you put them in the mud that you made for your mask. You can make your own masks or slip in your favourite serum. I added mine along with the nutrient mist and it was a blast! I'm using sheets for masks with curcuma and honey and my favourite one iswith white egg! You can mix whatever you want in your mask. When my face is a mess, I always use the white egg mask. I whisk it and add a few drops of lemon. I can't tell you how much I LOVE using this mask (you need to try it!!) When I have a break out, I use it, when I'm not happy with the texture of my skin I use it and the results are breathtaking. I sound like a commercial, but it's truly like that. My skin looks smoother, there is no irritation or pimples. I was searching on the internet about what makes this white mask so good and this is what I found: collagen, protein and vitamin A. For faster results you should definitely give it a try, because it's easy to make and it gives you results over night. 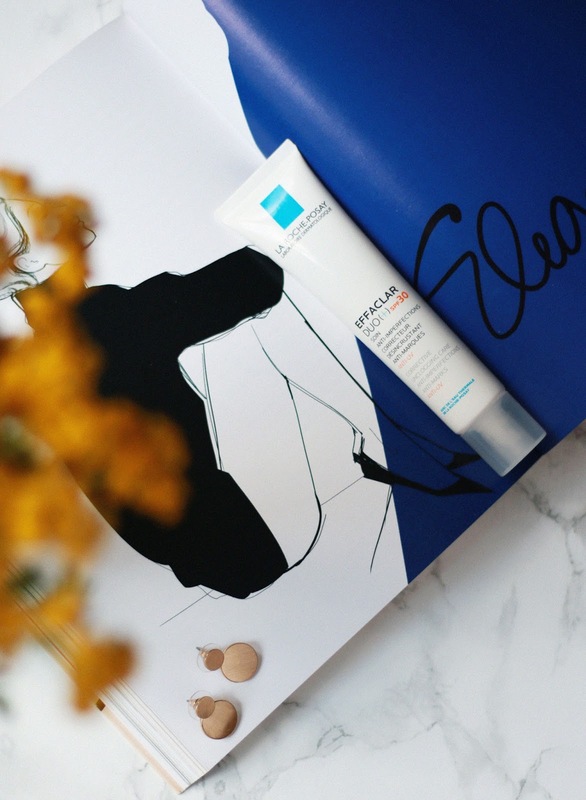 Next product I love using is La Roche Posay Effaclar Duo+ Unfiant spf 30 cream. If you are a follower from the early days you know that my favourite treatment for acne is this cream. I love the new version as well as the tinted one and I was very excited when I saw LRP come up with an spf one. I am using it every day before I go outside. I love using it by itself or in combination with Clinique BIY pigment drops, they work so well together! It's mattifying, preventing my skin from breakouts and it's protecting my skin from UV rays. I think it's a great add to everyday routine. YSL Mon Paris parfume is one of my favourite perfumes for spring and summer. It's sweet and bold! I love these type of perfumes. The top notes are a mix of blackberry, raspberry and pink pepper. The floral side includes notes of datura, white peony, sambac jasmine and orange blossom. It's fresh, airy and sweet. It's very interesting how the scent develops, at first it's a bit on a floral note and then it's sweet. Just the way I like it. Not to mention the pretty bottle. Design wise it is very chic and luxurious and the black bow gives it a great elegant finish. It smells divine and it lasts a really long time. I think this is a perfume I will always come back to! 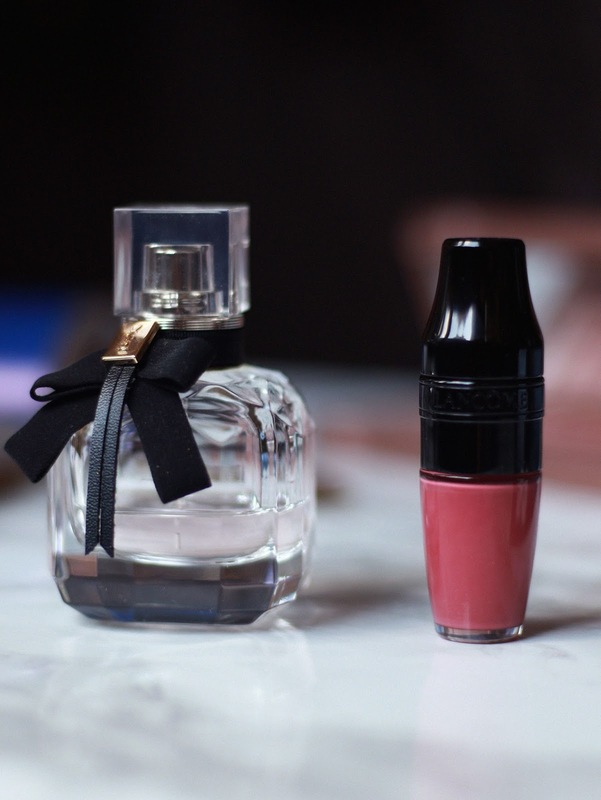 Lancome Matte Shaker is an innovation from th original Juicy shaker. I just looove this lipstick. It's obviously matte lipstick, but very lightweight and it's not drying at all! Shade is perfect, it's Beige Vintage 270. It's great for everyday as it's very similar to the color of my lips, but a slice darker. I'm wearing this everyday. It's my everyday color. I love everything about it: design, color, brush, longevity and finish. It's like you don't have anything on your lips and you can eat with lipstick on your lips and you will still have it on it. All recommendations from me! Last, but not least is Urban Decay Naked 3 palette. I thought that nothing can beat my favourite Too Faced Semi Sweet Chocolate bar palette, but I guess I was wrong! I have the UD Naked 2 palette, but I never really used it that much. I think that the first one is a bit more useful for me than the second one. I think it's a great gem for everyday makeup. It's a rare palette where you can actually use every single eyeshadow in it. Even the Semi Sweet chocolate bar had few of them that I never used. In this one, you can use every one of them for your everyday looks and you can easily turn them into night ones. I love it! Pigmentation is great, you get 12 eyeshadow times 1,3 grams. Longevity is amazing, I always use them with primer because I have oily eyelids and they last for hours. When everything melts down, I can always have my eyeshadow on fleek. You can easily use them without a primer, I like to use it just so I can be sure they will stay all day. I think this is a great product to invest in, because you have everything you need for your everyday and you can still easily turn it into a night one. You have 12 very pigmented and long lasting eyeshadows and if you are a lover of pink eyeshadows, I'm pretty sure you will love this one. I've been using it for months now and have hit the pan only with the lightest shade. You made it! This is end of my must have essentials for everyday. Tell me yours in the comments! These all sound like completely fabulous products!! I definitely need to check out the Mad Hippie Brand and Lancôme is always one of my favorites ! Thank you so much for such a thorough review !! I heard the same thing about Vitamin C serum, my skin has been a little dry lately. Thank you for sharing, I will definitely try this product. I have heard so many good reviews about La Roche Posay Effaclar Duo that I think I'll buy it tomorrow :) And this Vitamin C serum seems like great product as well. Thank you for this post! I'm definitely going to try the egg white mask because I'm always looking for natural skincare regimens! Thank you for this post! These are definitely some essential I need to go and get. thanks you for posting. Thank you for sharing these awesome products! I love to hear what everyone's daily routines are and steal a few ideas that will work for me, as well! So great to learn about this new brand Mad Hippie. The products look really great and definitely would love to check them out and try them. Need to really try Vitamin C Serum. Thank you for sharing a great review! Being the most popular beauty serum out there, I'm obviously missing out when it comes to the Mad Hippie Vitamin C Serum. If it works that great on your skin, it must be something special. Adding it to my wishlist asap! I definitely want to check out that serum!! Thank you for sharing some of your faves! Such a great review of all these amazing products! I am all about natural skincare products and Vitamin C serum is so good to brighten and energize the skin. My skin needs that Vitamin C serum from Mad Hippie! I love Vitamin C and it does wonders for the skin. That LRP will also help with my acne and sun protection with that added SPF. You have such great product recommendations! Thanks for sharing Ana! I am a fan of serums. Forever my go-to. This sounds like such a great recommendation! Thanks for sharing. Will definitely be checking it out. Looks like a fab list of essentials! 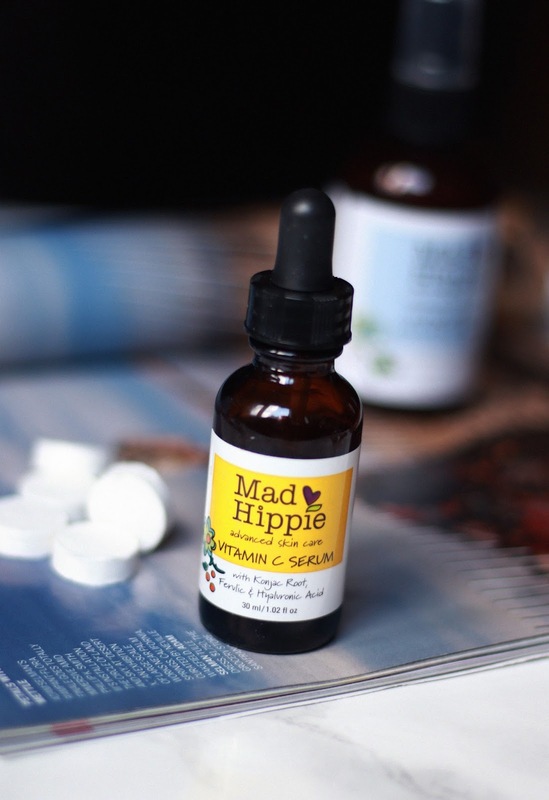 I always love trying new skincare so I'm definitely going to check out that Vitamin C serum from Mad Hippie! I love any product with Vitamin C in it. It's soooo good for the skin!